In Uruguay wood-impregnation plants use chromated copper arsenate (CCA) as preservative applying good manufacture practices (GMP). This study aims a retrospective evaluation of toxicologically relevant species levels in CCA exposed woodworker's urine (As-U) and an assessment of the effects of work risk factors and non-occupational sources in As-U of workers from a selected plant. From 2014 to 2016, As-U in 212 urine samples (As-U) of 73 woodworkers from six CCA impregnation plants were determined. In one of these plants, 35 workers were interviewed to obtain individual data of work tasks, lifestyles, diet, habits, etc. that may contribute to their overall exposure to Arsenic. Responses were statistically evaluated. Out of the 212 urine samples from 73 woodworkers, 96% showed lower levels of As-U than those established by health regulations (<35μgL-1). According to their work tasks 34% of 35 surveyed workers showed high exposure risk to As and 29% moderate exposure risk. Although they have lower levels of As-U owing to their personal protective equipment, As-U significantly correlate to work risk factors. Consumption of bottled water could also contribute to As-U levels as a non-occupational source. These results confirm that efforts of Uruguayan authorities to promote GMP were successful and justify the importance and frequency of As-U systematic biomonitoring for occupational risk assessment. A significant accomplishment of this work is that non-occupational sources of As-like bottled water consumption should also be considered in future studies. 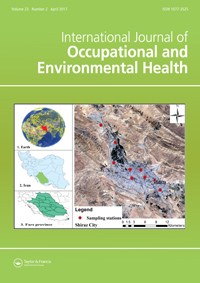 Bühl, Válery., “Biomonitoring of arsenic in woodworkers exposed to CCA and evaluation of other non-occupational sources in Uruguay,” RIQUIM - Repositorio Institucional de la Facultad de Química - UdelaR, accessed April 22, 2019, http://riquim.fq.edu.uy/items/show/4946.